April is National Facial Protection Month! According to an article from the April 2013 American Dental Association news, it's time for dentists to team up with athletes, patients and coaches to raise awareness about the importance of guarding against dental and facial injuries. From team sports like football, basketball and hockey, to recreational fun like biking and rollerblading, children and adults spend a lot of time and money on these activities, but often forget to use a mouth guard. According to the U.S. Centers for Disease Control and Prevention, more than half of the seven million sports and recreation-related injuries each year occur with children, some as young as 5 years old! The National Youth Sports Safety Foundation reported that athletes who don't wear mouth guards are sixty times more likely to damager their teeth. Despite this fact, 67% of all parents admit that their children do not wear a mouth guard during organized sports. One of the biggest problems is that most sports do not require their participants to wear a mouth guard. To help prevent tooth damage and preserve our patients' beautiful smiles, the Cedar Rapids Smile Center provides athletic mouth guards to any of our current patients of record at no charge. These mouth guards are custom fit and are just like the ones you see professional basketball players wear on TV. They are secure, comfortable, and give you the ability to talk and breathe easily. There is nothing more precious than a beautiful smile. Please give us a call today and protect your smile! 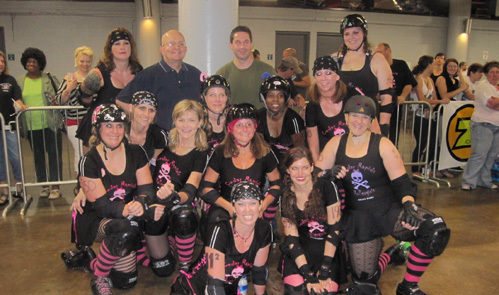 We sponsor the Cedar Rapids Roller Derby team and make all of their mouth guards! Contact us for more information about Mouthguards.